» Back To School Lights! Camera! Vegan! 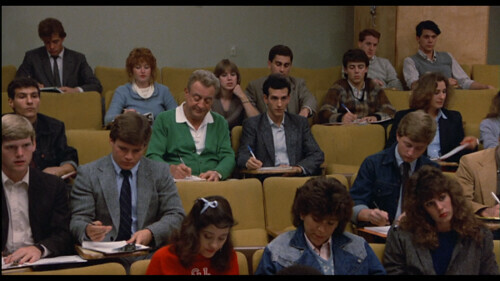 Back To School is 96 minutes of Rodney Dangerfield’s famous one-liners with some filler about parties and school and diving meets, aka totally hilarious. Thornton Melon is a totally self-made millionaire, but lacking a formal education. After his wife cheats on him, Thornton decides to visit his son at college where he finds out that his son is miserable. To help his son out (and because he is clearly having a mid-life crisis of some sort), he decides to enroll too! Money is thrown everywhere, ridiculous stunts are pulled to get him, his son, and their roommate what they want. Having Oingo Boingo play your dorm party? Sure. Hiring Kurt Vonnegut to write a paper about himself? Why not! Of course, you can’t buy everything. Despite having all of this money, Thornton is nothing less than an awesome guy. He loves his son, he is free with his money and favors. The big issue is that he’s so used to buying things and doing what he wants when he wants, he doesn’t handle the responsibilities of college too well. But in the end, with a studying montage, he is able to pull through and squeak by with a solid D average! The American dream. Starring Rodney Dangerfield (Caddyshack, Ladybugs), Sally Kellerman (MASH, her voice), Burt Young (all of the Rocky movies), Keith Gordon (Christine, director), Terry Farrell (DS9, Hellraiser III), Adrienne Barbeau (Escape From New York [she was married to John Carpenter], Carnivale), and William Zabka (the blonde bully from The Karate Kid and Just One of the Guys, Hot Tub Time Machine). Robert Downey Jr. is really good as the roommate, sadly his career never really took off. Who knows what he’s up to these days. This is a great movie to play ‘spot the cameo’. Can you find Robert Picardo from Star Trek Voyager? Entree: If you have Vegan Sandwiches, I recommend The Party Monster (page 124), or the recipe posted below! Rodney Dangerfield dumps a couple of appetizer trays into a hollowed out loaf, so I picked the sandwich that I thought was closest match, in spirit, to that strange concoction (no deviled eggs here). Side: Dive into this three layer (Triple Lindy) dip! Dessert: It’s just not college without copious amounts of beer (cupcakes). You should really use Miller to make it a proper tribute. To make the seitan: Preheat the oven to 400 degrees F. Combine the seitan, wine, pepper, and salt in a 9 x 13 inch pan. Baked for ten minutes, or until the liquid has evaporated. To make the onions: Heat the oil in a large skillet over medium heat. Add the onion and cook, stirring, for ten minutes, or until softened. Stir in the sauce. Cook for two minutes longer. Set aside and keep until warm. To make the dressing: Mix all the ingredients together in a small bowl until smooth. To make the pickles: Line a plate with paper towels. In a medium-size bowl, toss the pickles with one tablespoon of the floor. Pour 1/4 an inch of oil into a large skillet and heat over medium-high heat. in a pie plate, stir together the milk, remaining five tablespoons of flour, baking powder, and paprika. Working in batches, dip the floured pickles into the batter, then place in the skillet. Cook for three minutes, or until golden. Turn and cook the other side for two minutes. transfer to the plate to drain. To assemble the sandwiches: Spread the dressing evenly on both sides of the bread. Layer with the seitan, onions, pickles, lettuce, and tomato; replace the top of the bread. Cut int four pieces and serve.